Here are three rock-solid stocks that have beaten the market over the long term with less stock price volatility. You can't completely wring out all risk from investing in stocks. However, you can significantly lower your level of risk by investing in certain types of stocks. Look for companies that are leaders in their fields, provide an essential product or service that isn't likely to be disrupted by technological advances or other societal changes, operate in industries that have high barriers to entry, and, preferably, pay a dividend. 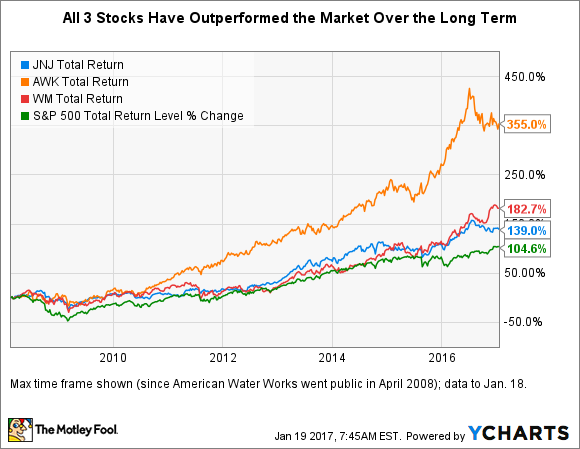 Three such stocks that have beaten the market over the long term and should continue to do so are Johnson & Johnson (NYSE:JNJ), American Water Works (NYSE:AWK), and Waste Management (NYSE:WM). Healthcare giant Johnson & Johnson, founded in 1886, has an empire that spans three business units -- consumer packaged goods, pharmaceuticals, and medical devices. Its consumer products -- such as Band-Aid adhesives, Listerine mouthwash, and Advil over-the-counter painkillers -- have been staples in most households in the United States and much of the developed world for generations. J&J's pharmaceuticals business is the fifth largest in the world, and its medical devices business is the most complete. Johnson & Johnson sells products and services that many of us couldn't live without, at least not comfortably or healthily. The company's brand strength provides considerable barriers to entry in its consumer products business, while regulatory hurdles and extensive partnerships help to keep new entrants at bay in the two other broad industries in which it operates. Many investors favor Johnson & Johnson stock for its dividend. The current yield of 2.75% offers a premium of 37% over the S&P 500's 2.01% yield. J&J's dividend is secure and dependable: The stock's trailing-12-month cash dividend payout ratio (dividends paid divided by free cash flow) is 63.6%. While there are various factors that come into play, a rough rule of thumb is that a cash dividend payout ratio of about 60%-65% or less suggests that a company can comfortably afford its dividend payments and investors can probably expect future increases (assuming no major unexpected negative impacts to its business). J&J is a Dividend Aristocrat, one of only about 50 S&P 500 constituency companies that have increased their dividend payouts for at least 25 consecutive years. It has hiked its dividend for 54 consecutive years. Johnson & Johnson also has solid growth potential, thanks to several demographic trends, including the aging of baby boomers. Analysts project it will grow earnings per share (EPS) at an average annual rate of 6.5% over the next five years. Much of this growth should be fueled by its pharmaceutical business, which accounted for 47% of its revenue in the third quarter, and is growing faster than its other two segments. Like J&J, leading water utility American Water Works was founded in 1886, just as the second leg of the Industrial Revolution in the U.S. was getting under way. Its stock, however, has only been listed on a U.S. exchange since 2008, when a German energy conglomerate spun it off. American Water takes a back seat to no company in the world when it comes to providing an indispensable product or service. Most of us would perish in a mere three to five days without having any water to drink. As the largest publicly traded water utility in the U.S., American Water provides water and wastewater services to about 15 million people in 47 U.S. states and Ontario, Canada. The lion's share of its revenue is generated by its regulated business, which operates in 16 U.S. states, though it also has several market-based businesses. The company also has good growth prospects. There's plenty of room for its regulated business to grow through continued acquisitions because the water utility industry in the U.S. is quite fragmented. Analysts estimate it will grow EPS at an average annual rate of 7.6% over the next five years. American Water also pays a modest dividend, currently yielding 2.02%. It's raised its dividend every year since it went public in 2008. This doesn't necessarily mean, however, that it will continue doing so. Waste Management is North America's largest waste handling company, providing collection, transfer, recycling, resource recovery, and disposal services to residential, commercial, industrial, and municipal customers. The company was officially founded in 1968, but its roots go back to 1893 when an entrepreneurial Dutch immigrant began hauling garbage in Chicago using a horse-drawn wagon. Waste Management operates in an industry with considerable barriers to entry, which include high, fixed start-up costs, longtime relationships with customers, and regulatory hurdles with respect to landfills. These factors help keep potential new competitors at bay. The company has a reputation for being shareholder-friendly. It has raised its dividend, currently yielding 2.36%, every year since 2004. Waste Management's cash dividend payout ratio is just 51.2%. As noted previously, a ratio of about 60%-65% or less suggests that a company can comfortably afford its dividend payments and investors can likely expect future dividend hikes. The company also actively buys back its stock. Moreover, there's more growth potential in trash than most folks might expect -- something sure to please both investors and Oscar the Grouch. Analysts project Waste Management will grow EPS at at an average annual rate of 10.6% over the next five years.